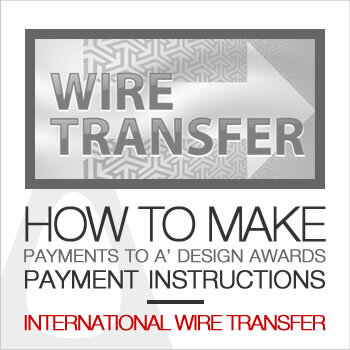 This page describes how to make an electronic fund transfer to A' Design Competition and Award. How to Nominate an Entry using WireTransfer? Step 0 : You should upload your design first. Step 1 : Go to your bank and tell the clerk that you want to do a "International Wire Transfer / EFT". Scroll down to bottom of this page if you need a proforma invoice before you could make a wiretransfer. Step 3 : At the bank, when making the money transfer, as a cause / description of transaction you need to state "ADA-[#Indicate the design id that you want to pay the nomination fees of]". (Example: ADA-#22222). If you are making a different kind of payment, indicate your email address or userid ( you need to be logged-in to view your userid ) as the cause of payment. This is very important. Step 4 : Send the exact payment amount as written in the nomination page. Ask a receipt from the bank indicating the payment. Leave the bank, and get online, login to A' Design Award website. Step 5 : After logging-in, from your control panel, go to nominate a design page and click the design you want to nominate. Step 6 : There is a link under this page, next to the nomination button that says: "By default, payments are made by "Credit Card". If you need to pay with other methods (such as Bank Transfer, Electronic Money, Paypal, etc) click here instead." click on that link (this is a dynamic link that changes with each design). Step 7 : A new page "Payment with other methods" will appear, choose Award Category and continue by pressing "CONTINUE PAYMENT" button. Step 8 : In this page, from the "Payment Method" menu choose "Wire Transfer via an International Banking Network". Step 9 : Enter the"ADA-[#Indicate the design id that you want to pay the nomination fees of]". (Example: ADA-#22222). If you are making a different kind of payment, indicate your email address or userid ( you need to be logged-in to view your userid). (which you have written in step 4) to AUTH/REFERENCE CODE field and press "CONTINUE PAYMENT" and we will manually confirm the transaction afterwards. How to Request a Proforma Invoice? If you are going to nominate one or two entries, simply follow the procedure above from Step 5 (Nominate a Design) for each entry. If you need the proforma invoice for nomination packages or other payments or if you are going to nominate more than 2 entries please go to your control panel and request a proforma invoice from the "Request Proforma Invoice" section (in the Corporate Panel Tab).